The Rug Renovating Company, the oldest rug cleaning business in the United States, was founded in 1896 in New York and has been family owned and operated continuously since that time. The company is currently run by fourth-generation owner Paul Iskyan. The company was originally located in the Astoria neighborhood in Queens, moving to its current facility in East Orange, N. J., where it occupies more than 70,000 square feet and has more than 60 employees, about 16 years ago. Rug Reno, as it is known, uses two rinser/wringers, rug washing equipment from the Moore Company. First, the rugs are dusted then floor washed and finally put through a rinser/winger. They have a 120-pole automatic dry room and a 70-pole still (or stationary) dry room. The company also offers urine decontamination of rugs. This large operation uses 40,000 gallons of water a day. 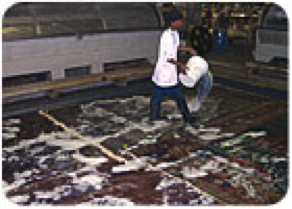 Rug Reno is the largest rug restoration and refinishing company in the country. They process 25,000 to 30,000 rugs per year. Since the company started, an estimated 5 million rugs, or 400 million square feet, have been washed in its facility. That’s a lot of rugs! Chemical washing of rugs is a process developed by the Iskyan family at the turn of the 20th century. The process is analogous to taking a new car off the trailer and washing and waxing it to make it showroom ready. Two basic chemical washing are offered. Luster Wash is a light wash that gives the rug an improved sheen. Rugs are put in a large stainless steel wash wheel and agitated to help clean and add luster to the rug pile. A second more aggressive process is known as Antique Wash. This heavy wash strips brightly colored rugs for a muted effect. All the rug’s colors are reduced by a certain degree, but certain colors are reduced more than others. The process can take between one and three hours. 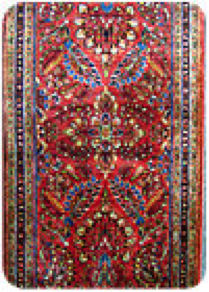 Around 1920, Rug Reno developed the process that produced the American Sarouk (Image I). This rug was only sold to the U.S. market. Sarouk rugs weaved in Persia were given a heavy Antique Wash to remove a coral-red color not popular at the time. The rug field was then over-dyed a darker burgundy red and washed a second time. This finish is perfectly colorfast to light and future washings. Many rugs from Hamadan, Mahal, Lillihan and Kashan were also given this special treatment. At the height of the American Sarouk’s popularity, Rug Reno employed 300 women who over-dyed rugs. This continued into the 1960s. As fashions changed, the 1980s saw these same rugs have the burgundy stripped out to bring back the original color. Over the years there have been cycles in the rug importing business. During World War II, the company performed washing of life preservers. In the late 1970s the U.S. stopped doing business with Iran; this significantly reduced the amount of chemical rug washing being performed. It was during this time that Rug Reno began retail rug washing. The company now performs in-home carpet and upholstery cleaning, with 10 on-location crews and seven rug-pickup and delivery trucks. They also have eight employees doing rug repair. With over 100 years’ experience cleaning and repairing millions of rugs, carpets and other fine furnishings, The Rug Renovating Company and the Iskyan family are truly in a league of their own.